Serving our own, fresh from the boat lobsters, and everything that goes along with them, right on the shore of Mount Desert Island’s busiest working harbor. 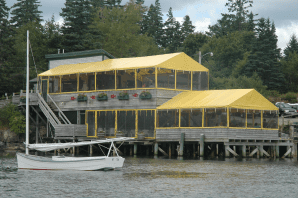 From Memorial Day weekend through mid October, Thurston’s Lobster Pound provides a friendly, relaxed dining experience that is quintessentially Maine. Sitting on a dock that hovers over the bay, our awning covered dining rooms create the perfect balance of outside and in. From your seat above the harbor, you’ll see the lobster boats return to our wharf with the day’s catch. Watch the crew carry those same lobsters up to our restaurant tank, and try to imagine a fresher, more local meal! Our menu is centered around locally harvested lobster and crab, while also offering a full range of options for those without a love for seafood. Your meal, whether a traditional lobster dinner, or a cheeseburger and potato salad, will be prepared with the freshest ingredients. We look forward to serving you!